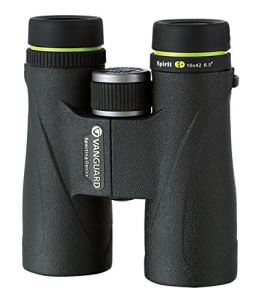 The new set of Vanguard Spirit ED binoculars offers cutting-edge enhancements in ocular technology. State-of-the-art developments take into mind not only technical conveniences but also the visual necessities of the individual user. Does that make Vanguard’s Spirit ED the “perfect” set of binoculars? That would be up to the individual, although many users have already given them the thumbs-up. Still, readers should research before making any decision. The most popular Spirit size is the 8×42 due to its broader viewing capabilities. That’s not to say the 10×42 is of inferior quality. Both offer similar features and are widely sought. Viewing, however, leads the list as far as most users’ needs and preferences go. The differences between the two rest primarily in body and lens size, hence the greater viewing range with the 8×42 size. Below are the specs for both ‘8×42’ and the ‘10×42’ sizes. Where no distinction is made, the details generally apply to both. Body & Chassis – Tactile armoring made of durable rubber dampens sounds and is damage resistant. The lightweight, user-friendly design offers hand grooves along the barrels’ undersides for ease and comfort in handling. Twist-Out Eye Cups – Two-stage maneuverability provides longer eye relief. Since the eye cups touch the skin directly, such positioning protects the interior lenses from over-exposure to unaccommodating weather and other threatening environmental conditions. Advanced BaK4 Prism: Circular field of view allows better viewing performance. ED, or Extra Low-Dispersing, Glass – Prism and lenses align filtered color to converge on the same focal plane in order to minimize chromatic aberration and ensure the maximum brightness, sharpness and contrast of every image, near and far. Color reproduction is acute and spans the spectrum of natural greens and other hues. Multicoated Lenses – Innovative design includes AR and V-Max coatings that create optimum light transmissions and low-light performance, such as at nightfall. Optical glass reflects ten percent of light while permitting the other ninety percent to stream in so all imagery is bright, sharp and of high contrast. HydroGuard – External hydrophobic coating facilitates lens cleaning and simultaneously allows for better performance in wet environmental conditions. Short Near-Focus: Closer views are sharp, vivid and distinct as well. Waterproof/Fog-Proof: Ergonomic construction prevents damage that could result from the surrounding environment or inclement weather. Focusing Wheel – Central position provides for aesthetics and functionality. Diopter knob makes possible separate adjustments to lenses, depending on the user’s visual needs. Tripod Mount – Central cover unscrews so users can attach binoculars to a set of tripod for stable, long-term viewing. Carry Case – This nylon or polyester case exhibits outside panels and interior foam cushioning to ensure firm packing when binoculars are not in use. A nylon strap allows for either hand- or neck-carrying as necessary. IMPORTANT NOTE: Those interested should inquire first to see if the case in included. It might not be. Never assume. Testing panels have praised the Spirit ED for its innovation and ideal combination of technical features and a user-friendly design. Apparently, nothing is frivolous here, yet the Spirit ED unit is still appealing to many. That’s worth of consideration.